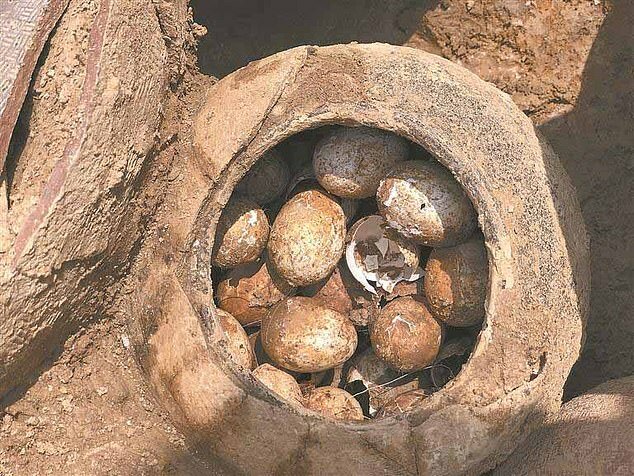 A team of Chinese archeologists uncovered a large jar of eggs that were thought to have been buried in a tomb for about 2,500 years. Around 20 eggs were found and their shells appeared greenish blue, according to experts. They were kept in a clay jar with a closed lid when experts found them in an excavation site in eastern China’s Shangxing Town on Sunday, reported Yangzi Evening News. Like a real-life echo to China’s controversial delicacy, the century eggs, these ancient eggs are said to date back more than two millennia to the country’s Spring and Autumn period (770-476BC). Experts say the eggs are similar to modern-day free-range eggs in size. They also suspect that the content inside the eggs is likely to have degraded over time, leaving only the shells which are formed largely by calcium. In addition to the eggs, experts found a number of porcelain cups, pots, plates and other cookware in the same tomb near the city of Nanjing, one of China’s ancient capitals. '(The containers) were covered by mud, and the jar (with the eggs) were found above the mud. 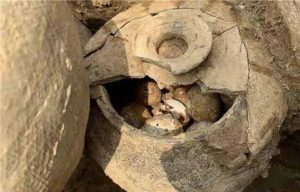 We opened the lid and saw there were eggs,’ one of the archaeologists, named Zhou Hengming, told Nanjing-based Modern Express. The extraordinary findings were excavated from a multi-level ancient tomb complex, which is thought to belong to a clan and contains 38 tomb chambers. There are a total of six layers in the tomb complex and the eggs were discovered in a chamber on the second to the lowest level. The owner of the tomb chamber was thought to be an important figure in the family as a full set of cookware and dinnerware were found in the chamber, experts told Modern Express. Experts believe that the family members of the tomb’s owner wouldn’t want him or her to starve in the afterlife, therefore they buried a large number of containers and plenty of food. The eggs were discovered by archaeologists from the Nanjing Archaeological Institute and the Liyang Museum. They are expected to undergo further lab tests. Last September, archaeologists in central China’s Luoyang claimed to have found a pot of wine from more than 2,000 years ago in an ancient tomb. 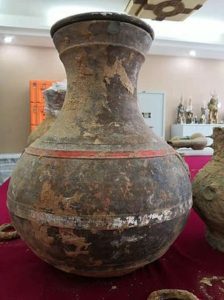 The tipple was unearthed inside a tomb thought to belong to a local official in the ancient capital of Luoyang in central China. 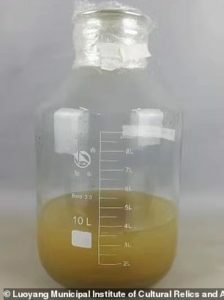 A total of 3.5 liters of liquid was discovered in a bronze vessel and it was thought to date back to China’s West Han Dynasty (202BC-8AD).